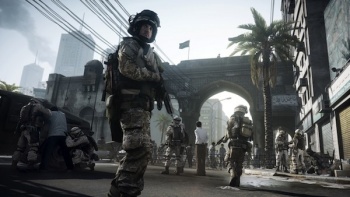 Industry analyst Doug Creutz has increased his first-year sales prediction for Battlefield 3, saying that preorders so far are "roughly comparable" to last year's hit Call of Duty: Black Ops. Sales predictions, when you get right down to it, don't mean a whole lot, but the word coming out of Cowen & Co. has to be making EA smile nonetheless. Analyst Doug Creutz has increased his first-year sales estimate for the upcoming Battlefield 3 from a very respectable eight million units to 11 million, noting that BF3 preorders to this point are "roughly comparable" to Activision's 2010 release Call of Duty: Black Ops. That game has sold more than 20 million units worldwide since its release. Battlefield 3 is EA's best shot at reclaiming the modern combat shooter crown - or at the very least, becoming a legitimate contender once again. The previous game to square off against the Modern Warfare juggernaut, the 2010 Medal of Honor reboot, managed to break five million unit sales, enough to earn a sequel but not to be any real threat to the Call of Duty dominance. If Creutz is correct, Battlefield 3 could very well succeed where Medal of Honor did not, although the odds of it actually taking home the belt are just about non-existent: BF3 may be running neck-and-neck with Black Ops, but the upcoming Modern Warfare 3 is handily beating them both.